Welcome to CustomMagnetOutlet.com, where you can expect the highest quality custom promotional magnets at industry low prices. Our in-house staff believes in live personal contact with customers, outstanding design work and delivery of magnets that are made right and delivered fast! 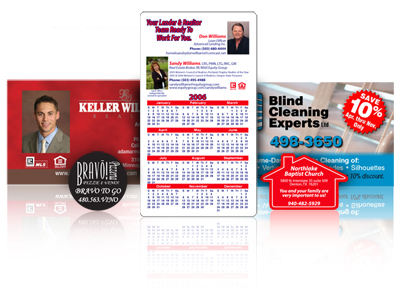 Custom printed magnets are one of the hottest advertisement tools in existence. Why not jump in on the action? With our custom printed magnets, have your logo, company, or product posted on refrigerators, filing cabinets, vehicles, mailboxes and just about anything made of metal, so that your products or service will always be in the eye of your clients and customers! We also specialize in Custom Hand Fans. Hand-fans are ever increasing in popularity and can be seen at just about any sporting event, outdoor wedding, church service, corporate meetings, re-unions and parties of all kinds! Check out our variety of in-stock hand fan shapes or give us a call or email with your custom hand fan shape and we will create it for you. Our design service is FREE OF CHARGE! Please browse the very informative pages of our website and give us a call on our TOLL FREE number at 866.428.7974 or email us through our FREE QUOTE page or at Sales@CustomMagnetOutlet.com where one of our talented associates is waiting to assist you now! Take a look through the pages of our site, made simple to help acquaint you with our simple way of doing business, then give us a call or email. We are waiting to place your custom magnet order today.